What little white lies have you told this week? That dress is just adorable!! I love the denim jacket paired with it as well! Perfect LWD! Love your little lies :) We all tell them! That LWD is adorable on you! Haha, having 2 dogs is awesome at times and other times, not so much! Definitely the first one! It's so hard to not push the snooze button. Hey we all lie sometimes right?! And I just told someone something looked cute when it really didn't and I feel bad...but sometimes lying is better than hurting someone's feelings :) You look SO cute...love those wedges! Haha this is funny :) Also your hair looks great...and that is not a lie. With you on the getting up on time...the snooze button is much more fun. You look pretty in white and denim, plus I think that fedora looks great on ya! What a great dress! Love how you rocked the fedora...they just look awful on me. I really love those wedges. They look very plain but the neutral color makes them so nice! The lace dress with the denim jacket is so classic! Love it. And have you been working out?? Your arms look amazing! Haha, he didn't, but when he tells you that you look fantastic, he isn't lying. GOOD FOR YOU GUYS!! Its working, love it! This is one fabulous easy breezy look I'd like to do soon this summer.....great job Jess!!! 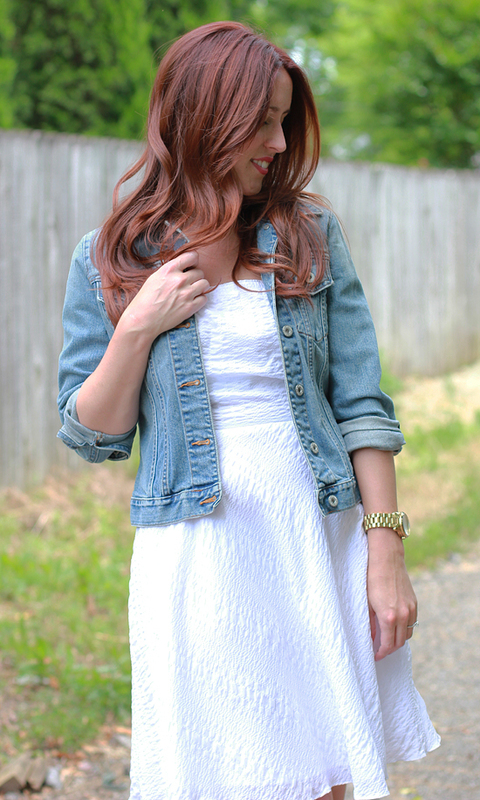 The denim jacket white combo is just so good! I really love the shade and color of this Gap jacket!